The Daffodil Day Luncheon Committee, from all over Southeastern Michigan, is busy planning the 2013 Daffodil Day Luncheon, for our membership and their guests. In 2012, WNFGA-Michigan purchased 21,900 daffodils bulbs which were planted on Belle Ile. This spring, over 65,000 bulbs will bloom on Belle Isle-and we’re just getting started. Thanks to all 362 of you who attended last year, and a special donation from the Bloomfield Hills branch, we were able to more than double the number of bulbs to be planted. 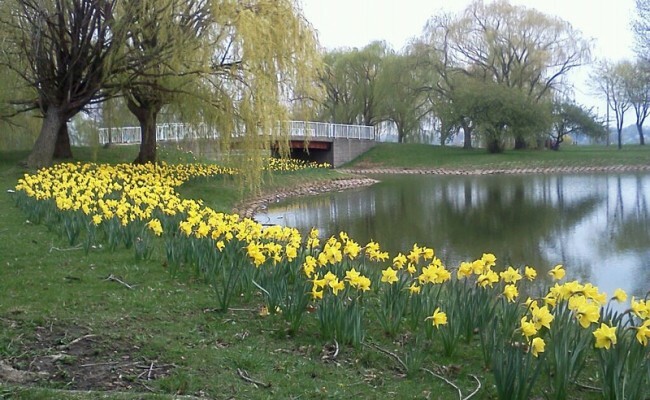 Mark your calendars for Wednesday, April 17, 2013 and plan to attend the 4th annual “Daffodil Day on Belle Isle.” Our keynote speaker will be Sue Mosey, the visionary President of Midtown Detroit, Inc, who is restoring the area around Wayne State University. All proceeds from the luncheon will go toward the purchase of more daffodil bulbs, so let’s make it 250,000 this year! We have an exciting day planned! 10:30 a.m. Newly Re-opened Aquarium and Conservatory Tour: The recently reopened Aquarium will have for a special docent lead tour for us. Usually only open Saturday, it is completely staffed and maintained by volunteers. Docents will also lead tours of the Conservatory, the restored terrace, formal garden and the Marshall Fredericks fountain. 11:00 a.m. Registration and Social Hour (Cash Bar): On second floor of the Detroit Yacht Club, enjoy a glass of wine while you greet old and make new friends. 12:00 Noon: Lunch in the Grand Ballroom: The entrée is chicken piccata with lemon, capers, white wine and artichoke hearts. Dessert is our favorite, “daffodil yellow” lemon chiffon cake with a raspberry drizzle. Note: vegetarian ravioli is available. Program will start during dessert. Introduce of our invited Guests: Mayor Dave Bing and Mrs. Yvette Bing, Sarah Earley, Founder and President The Belle Isle Conservancy; Keith Flournoy, member Belle Isle Conservancy and Park Manager; Jan Ellison, Belle Isle Conservancy Board of Directors, and Roberta Henrion, Belle Isle Conservancy Observation Committee. After the program, a docent-led tour of the Detroit Yacht Club will be available. Pewabic tiles are available at the special price of $20. 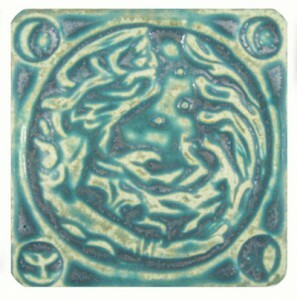 This year we are offering the four inch square “Water Tile” in Pewabic green. You must pre-order your tile. Tiles may be picked up before or after the program.